And that is where the data gets confusing. If Britain is already meeting a larger percentage of its budget deficit by seigniorage than Germany did at the height of its hyperinflation, why is the pound now worth about as much on foreign exchange markets as it was nine years ago, under circumstances said to have driven the mark to a trillionth of its former value in the same period, and most of this in only two years? Meanwhile, the U.S. dollar has actually gotten stronger relative to other currencies since the policy was begun last year of massive “quantitative easing” (today’s euphemism for seigniorage).3 Central banks rather than governments are now doing the printing, but the effect on the money supply should be the same as in the government money-printing schemes of old. The government debt bought by the central banks is never actually paid off but is just rolled over from year to year; and once the new money is in the money supply, it stays there, diluting the value of the currency. So why haven’t our currencies already collapsed to a trillionth of their former value, as happened in Weimar Germany? Indeed, if it were a simple question of supply and demand, a government would have to print a trillion times its earlier money supply to drop its currency by a factor of a trillion; and even the German government isn’t charged with having done that. Something else must have been going on in the Weimar Republic, but what? While Hitler clearly deserves the opprobrium heaped on him for his later atrocities, he was enormously popular with his own people, at least for a time. This was evidently because he rescued Germany from the throes of a worldwide depression – and he did it through a plan of public works paid for with currency generated by the government itself. Projects were first earmarked for funding, including flood control, repair of public buildings and private residences, and construction of new buildings, roads, bridges, canals, and port facilities. The projected cost of the various programs was fixed at one billion units of the national currency. One billion non-inflationary bills of exchange called Labor Treasury Certificates were then issued against this cost. Millions of people were put to work on these projects, and the workers were paid with the Treasury Certificates. The workers then spent the certificates on goods and services, creating more jobs for more people. These certificates were not actually debt-free but were issued as bonds, and the government paid interest on them to the bearers. But the certificates circulated as money and were renewable indefinitely, making them a de facto currency; and they avoided the need to borrow from international lenders or to pay off international debts.6 The Treasury Certificates did not trade on foreign currency markets, so they were beyond the reach of the currency speculators. They could not be sold short because there was no one to sell them to, so they retained their value. Germany’s scheme for escaping its crippling debt and reinvigorating a moribund economy was clever, but it was not actually original with the Germans. The notion that a government could fund itself by printing and delivering paper receipts for goods and services received was first devised by the American colonists. Benjamin Franklin credited the remarkable growth and abundance in the colonies, at a time when English workers were suffering the impoverished conditions of the Industrial Revolution, to the colonists’ unique system of government-issued money. In the nineteenth century, Senator Henry Clay called this the “American system,” distinguishing it from the “British system” of privately-issued paper banknotes. After the American Revolution, the American system was replaced in the U.S. with banker-created money; but government-issued money was revived during the Civil War, when Abraham Lincoln funded his government with U.S. Notes or “Greenbacks” issued by the Treasury. This was also true in Zimbabwe, a dramatic contemporary example of runaway inflation. The crisis dated back to 2001, when Zimbabwe defaulted on its loans and the IMF refused to make the usual accommodations, including refinancing and loan forgiveness. Apparently, the IMF’s intention was to punish the country for political policies of which it disapproved, including land reform measures that involved reclaiming the lands of wealthy landowners. Zimbabwe’s credit was ruined and it could not get loans elsewhere, so the government resorted to issuing its own national currency and using the money to buy U.S. dollars on the foreign-exchange market. These dollars were then used to pay the IMF and regain the country’s credit rating.8 According to a statement by the Zimbabwe central bank, the hyperinflation was caused by speculators who manipulated the foreign-exchange market, charging exorbitant rates for U.S. dollars, causing a drastic devaluation of the Zimbabwe currency. 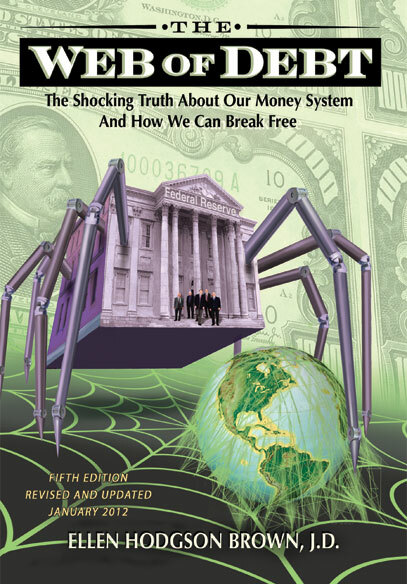 Is the United States, then, out of the hyperinflationary woods with its “quantitative easing” scheme? Maybe, maybe not. To the extent that the newly-created money will be used for real economic development and growth, funding by seigniorage is not likely to inflate prices, because supply and demand will rise together. Using quantitative easing to fund infrastructure and other productive projects, as in President Obama’s stimulus package, could invigorate the economy as promised, producing the sort of abundance reported by Benjamin Franklin in America’s flourishing early years. 8. “Bags of Bricks: Zimbabweans Get New Money – for What It’s Worth,” The Economist (August 24, 2006); Thomas Homes, “IMF Contributes to Zimbabwe’s Hyperinflation,” www.newzimbabwe.com (March 5, 2006).